Patients recovering from injury, trauma or surgery, who need to restore mobility and strength may have difficulty overcoming the forces of gravity. Despite the best attempts to “unload” the affected joints, ligaments, muscles or discs of the body with land based rehabilitation exercises, (even in recumbent positions, graded tilt table type of activities) some patients can’t quite tolerate the stresses imposed in land based regimens. For those patient-clients, Aquatic Physical Therapy can be a helpful modality to remobilize and restrengthen the body. Each session is led by aquatic therapy-trained Physical Therapists. 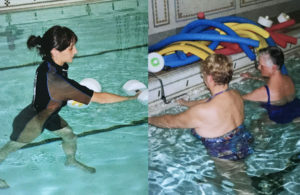 Candidates for aquatic therapy include those recovering surgery and patients requiring full body resistance in a gravity eliminated position. For more information on group classes contact Penny Allyn, Lisbon Site Manager, 860-376-2564.